The two Indian Army Officers barbarically murdered. New Delhi, 2nd May 2017: Indian Minister of Defence, Arun Jaitley has condemned the murder of two Indian soldiers whose bodies were allegedly mutilated by members of the Pakistan army, saying their deaths are barbaric acts, which are “unheard of even in a war”. After being involved in a rocket and mortar firing on the Line of Control in Krishna Ghati Sector, the two soldiers were beheaded, according to the Senior Army Officer. 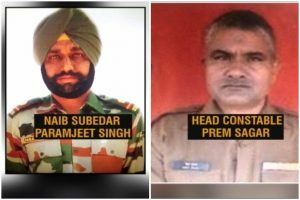 The deceased have been identified as Head Constable Prem Sagar of the 200th Battalion of the BSF and Naib Subedar Paramjit Singh of 22 Sikh Regiment of the Army. Pakistan’s Foreign Affairs Minister Nafees Zakaria claims the country’s Army did not commit any violations and that all allegations of mutilation are false. “This is a barbaric and cowardly act of naked aggression and incitement which the civilised world must unite to condemn. The attack on the two soldiers of course is not the first time that the Pakistani security forces have acted with impunity’; During the 1999 Kargill War, the mutilated and dismembered bodies of Captain Saurabh Kalia and his five officers’ captured alive were returned to India in body bags. The Pakistani security forces have failed to account for their actions. In addition, Captain Sanjeet Bhattacharjee and his fellow officer, Lance Naik Ram Bahadur Thapa were captured alive in 1997 by the Pakistani security forces. Despite numerous requests, the Pakistani have failed to disclose the fate of these officers. Further, the Pakistani authorities have failed to disclose the fate of the Indian POWs captured during the 1971 Indo-Pak War. This is only the tip of a plethora of cases of enforced disappearances in Pakistan.